At a posh dinner party, Steve Jobs eats a plate of raw vegetables with a blonde bombshell sitting on his knee. Instead of going to Macworld and plugging the Mac, he’s too busy partying with Tina the nymphette. 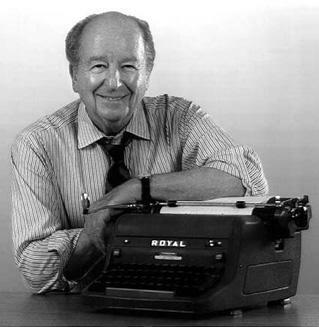 San Francisco Chronicle columnist Herb Caen. Steve Jobs didn’t make it to the first Macworld Expo in January, 1985. He was in the City all right, but he spent most of his time holed up at the Union Square Hyatt Hotel with his strikingly beautiful blond girlfriend at the time, who I only knew as “Tina.” I know this because Steve and Tina came to the dinner party I put together at the Sutter 500 restaurant during the Expo to celebrate the first anniversary of Macworld magazine and of the Macintosh itself. There were about 20 of us at the dinner including the late great San Francisco Chronicle columnist Herb Caen (pictured here); Will Hearst, then Editor and Publisher of the competing San Francisco Examiner; John Sculley, CEO of Apple; John Warnock, founder of the software company Adobe; and Ted Leonsis, the AOL Executive who these days owns the Washington Wizards NBA team and the Washington Capitals, an NHL hockey team. While everyone else at the dinner wore formal or business attire, Steve and Tina arrived in blue jeans and T-shirts. Tina was barefoot. They showed up shortly after the rest of us had sat down at a long table. I was at the head of the table, Herb was to my right and Will to my left. Everyone on the right side moved down to make room for Steve who sat between Herb and myself. Tina sat on Steve’s lap. Last Fri. night, to celebrate the first birthday of Macworld, David Bunnell took over Sutter 500, where another major talent, Chef Hubert Keller, produced six dizzying courses. Dinner music was by a chirpy Macintosh playing a duet with a live clarinetist. Guest of honor: Steven Jobs, Apple’s chairman and the rock star of the computer world, who ate with one hand and cuddled a blond nymphet with the other. Steve had no idea who Herb Caen was, much less the tremendous clout he had with hundreds of thousands of Bay Area followers who religiously read his “Baghdad by the Bay” daily columns. One mention in one of Herb’s “three dot” columns could make or break your social life or even your career. So, I introduced Steve to Herb. This certainly got Will Hearst attention. “Hopefully, the Examiner,” he laughed. About this time, Chef Herbert Keller, who has since gone on to great fame at Fleur de Le, appeared from the kitchen. I had tipped him off earlier that Steve Jobs was a vegan and would not be eating the lamb chops or the wild salmon. He was thrilled though to have Steve in his restaurant and wanted to make sure he was happy. They collaborated on menu items, which turned out to be a large plate of raw vegetables that Steve and Tina shared, plus two glasses of apple juice. The conversation settled down to the usual social chatter you would expect at such a dinner with the exception of a few giggling exchanges between Steve and Tina. As there weren’t yet that many products available for the Mac, the show itself was confined to half the floor space at the Moscone Center—the other half was occupied by a boat show. 10,000 people from every state in the Union and several foreign countries paid to attend, roughly double what we had expected. John encouraged Steve to make an appearance. “You should really check it out Steve,” he pleaded. Macintosh sales had started off with a bang, thanks to the 1984 Super Bowl commercial and to the Mac’s ease of use and graphic capabilities, but by 1985 they had slowed considerably. Users were clamoring for more memory, a hard drive, a faster boot-up, color monitor, and other enhancements. The stunning success of the first Macworld Expo energized not just the Apple user base but Apple employees as well. Jobs may have been camping out with Tina, but the other Apple folks were at the Expo listening to their customers and when they left they had a renewed sense of urgency. I wonder if Steve Jobs had bothered to show up at the first Macworld Expo if he too might have regained his focus. Instead of buckling down to the task at hand, however, Steve got into a power struggle with Sculley and by the end of May he was sacked as the leader of the Mac division. Steve left the company in a huff. The first Macworld Expo he actually attended was in 1997, shortly after his return to Apple. Part 8: Pat McGovern Meets with Steve, the Deal is Done. Part 9: Steve is F*cking Great!